The Isetta is an Italian-designed microcar built under license in a number of different countries, including Spain, Belgium, France, Brazil, Germany, and the United Kingdom. Because of its egg shape and bubble-like windows, it became known as a bubble car, a name later given to other similar vehicles. In 1955, the BMW Isetta became the world's first mass-production car to achieve a fuel consumption of 3 L/100 km (94 mpg-imp; 78 mpg-US). [lower-alpha 1] It was the top-selling single-cylinder car in the world, with 161,728 units sold. Initially manufactured by the Italian firm Iso SpA, the name Isetta is the Italian diminutive form of ISO, meaning little ISO. The car originated with the Italian firm of Iso SpA. In the early 1950s the company was building refrigerators, motor scooters and small three-wheeled trucks. 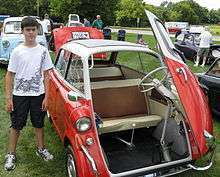 Iso's owner, Renzo Rivolta, decided he would like to build a small car for mass distribution. 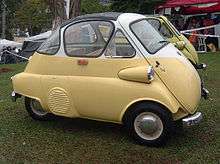 By 1952 the engineers Ermenegildo Preti and Pierluigi Raggi had designed a small car that used the motorcycle engine of the Iso Moto 200 and named it Isetta—an Italian diminutive meaning little ISO. The Isetta caused a sensation when it was introduced to the motoring press in Turin in November 1953, it was unlike anything seen before. Small (only 2.29 m (7.5 ft) long by 1.37 m (4.5 ft) wide) and egg-shaped, with bubble-type windows, the entire front end of the car hinged outwards to allow entry. In the event of a crash, the driver and passenger were to exit through the canvas sunroof. The steering wheel and instrument panel swung out with the single door, as this made access to the single bench seat simpler. The seat provided reasonable comfort for two occupants, and perhaps a small child. Behind the seat was a large parcel shelf with a spare wheel located below. A heater was optional, and ventilation was provided by opening the fabric sunroof. Power came from a 236 cc (14.4 cu in), 7.1 kW (9.5 hp) split-single two-stroke motorcycle engine. The engine was started by a combination generator-starter known as Dynastart. A manual gearbox provided four forward speeds and reverse. A chain drive connected the gearbox to a solid rear axle with a pair of closely spaced 25 cm (10 in) rear wheels. The first prototypes had one wheel at the rear, but having a single rear wheel made the car prone to roll-overs, so the rear wheel layout was changed to two wheels set 48 cm (19 in) apart from each other. This narrow track eliminated the need for a differential. The front axle was a modified version of a Dubonnet independent front suspension. The Isetta took over 30 seconds to reach 50 km/h (31 mph) from rest. Top speed was only about 75 km/h (47 mph). The fuel tank held only 13 litres (3.4 US gal; 2.9 imp gal). However, the Isetta would get somewhere between 50 mpg-imp (5.6 l/100 km; 42 mpg-US) and 70 mpg-imp (4.0 l/100 km; 58 mpg-US) depending on how it was driven. In 1954, Iso entered several Isettas in the legendary Mille Miglia where they took the top three spots in the economy classification. Over a distance of 1,600 km (1,000 mi) the drivers achieved an average speed of over 70 km/h (43 mph). In view of its maximum speed, which was just 15 km/h (9 mph) higher, this was an almost incredible figure. However, despite its initial success, the Isetta was beginning to slip in popularity at home. This was mainly due to renewed competition from Fiat with its 500C model. Renzo Rivolta wanted to concentrate on his new Iso Rivolta sports car, and was extremely interested in doing licensing deals. Plants in Spain and Belgium were already assembling Isettas and Autocarros using Italian made Iso components. 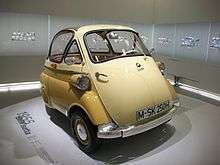 BMW began talking with Rivolta in mid-1954 and bought not just a license but the complete Isetta body tooling as well. 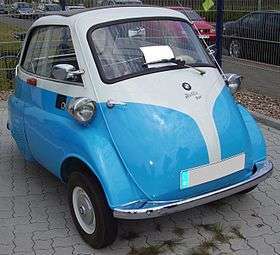 Rivolta did not stop with licensing the Isetta to BMW. He negotiated similar deals with companies in France and Brazil. After constructing some 1,000 units, production of the Italian built cars ceased in 1955, although Iso continued to build the Isetta in Spain until 1958. In addition to the Iso Turismo not described above, Iso also built the Autocarro, a commercial version with full-width rear axle. The Autocarro was offered in several body styles, a flatbed pickup, enclosed truck, a tilt-bed, or even a fire engine, although some of these might not have been sold. The Autocarro was an extremely popular type of vehicle in Italy, and numerous manufacturers produced some variant of the type. Iso had previously produced a motorcycle-type Isocarro. The Iso Autocarro was larger than most, with its four-wheel layout, conventional rear axle with differential and leaf springs, and a large tubular frame. It could carry a 500 kg (1,100 lb) load. 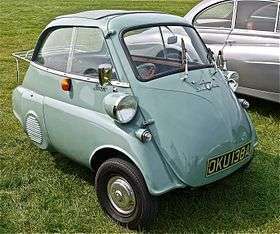 The name Isetta Autocarro was also used. It is thought that more than 4,000 Autocarros were built. In 1954, VELAM acquired a licence from Iso to manufacture a car based on the Isetta. Since Iso had sold the body making equipment to BMW, VELAM developed their own body but used the original Iso engine. 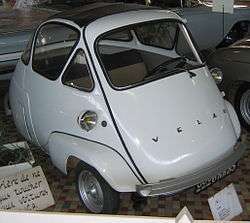 The VELAM body was rounder and more egg-like than Iso's Isetta and was known by the French as the ‘yogurt pot’. Instead of a chassis like the Italian and German versions, there was a sub-frame bolted to the body at the rear, which held the rear tires, engine, and transmission. The front suspension was bolted to the front of the body. The front door was opened by push button instead of a handle, and the speedometer was mounted in the center of the steering wheel. VELAM started production of the car in 1955 at the old Talbot factory at Suresnes, France and the car was introduced at the 1955 Paris car show. All told, five versions of the car were built: the standard Isetta, a convertible version, a luxury version, a one-off "Sport" version, and a race car. Due to competition from the Renault Dauphine, production ceased in 1958. In 1955, Iso licensed the Isetta to Romi, a machine-tool manufacturer headquartered in the city of Santa Bárbara d'Oeste, in the State of São Paulo. The Isetta was chosen because it was considered an ideal vehicle for use in the cities by virtue of its size and economy. Released on September 5, 1956, it was the first car produced in Brazil. The car had received government approval as a part of a state-supported drive to establish an automotive industry in Brazil, but ended up being built without government backing. Some 3,000 of the Romi-Isettas were manufactured from 1956 to 1961. They kept the Iso design and used Iso engines until 1958; in 1959 they switched to the BMW 300 cc engines. BMW made the Isetta its own. They redesigned the powerplant around a BMW one-cylinder, four-stroke, 247 cc motorcycle engine which generated 10 kW (13 hp). Although the major elements of the Italian design remained intact, BMW re-engineered much of the car, so much so that none of the parts between a BMW Isetta Moto Coupe and an Iso Isetta are interchangeable. The first BMW Isetta appeared in April 1955. In May 1962, three years after launching the conventionally modern-looking BMW 700, BMW ceased production of Isettas. A total of 161,728 units had been built. While it retained the "Bubble Window" styling, it differed from the Italian model in that its headlamps were fixed separately to the sides of the bodywork and it carried the BMW badge below the windscreen. The car was also redesigned to take a modified version of the 250 cc four-stroke engine from the BMW R25/3 motorcycle and the front suspension was changed. The single-cylinder generated 9 kW (12 hp) at 5800 rpm. The crankcase and cylinder were made of cast iron, the cylinder head of aluminium. However, the head was rotated by 180° compared with the motorcycle engine. The twin-bearing crankshaft was also different in the Isetta power unit, being larger and featuring reinforced bearings. One of the reasons for this was the heavy Dynastart unit which combined the dynamo and self-starter. The fuel mixture was provided by a Bing sliding throttle side draft motorcycle carburetor. In addition to further changes of detail, the BMW engineers enlarged the sump for installation in the car and cooled the engine by means of a radial fan and shrouded ducting. The power train from the four-speed gearbox to the two rear wheels was also unusual: fixed to the gearbox output drive was something called a Hardy disc, which was a cardan joint made of rubber. On the other side of it was a cardan shaft, and finally a second Hardy disc, which in turn was located at the entrance to a chain case. A duplex chain running in an oil bath led finally to a rigid shaft, at each end of which were the two rear wheels. Thanks to this elaborate power transfer, the engine-gearbox unit was both free of tension and well soundproofed in its linkage to the rear axle. In Germany, the Isetta could even be driven with a motorcycle license. The top speed of the Isetta 250 was rated as 85 km/h (53 mph). The first BMW Isetta rolled off the line in April 1955, and in the next eight months some 10,000 of the "bubblecars" were produced. In 1956, the government of the Federal Republic of Germany changed the regulations for motor vehicles. Class IV licences issued from that time onward could only be used to operate small motorcycles and could no longer be used to operate motor vehicles with a capacity of less than 250 cc. At the same time, the maximum capacity allowed for the Isetta's tax category was 300 cc. Class IV licences issued before the change in the regulations were grandfathered and allowed to be used as before. 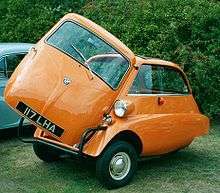 This change in regulations encouraged BMW to revise their Isetta microcars. In February 1956 a 300cc engine was introduced. The engineers enlarged the single cylinder to a 72 mm (2.8 in) bore and 73 mm (2.9 in) stroke, which gave a displacement of exactly 298 cc; at the same time, they raised the compression ratio from 6.8 to 7.0:1. As a result, the engine power output rose to 10 kW (13 hp) at 5200 rpm, and the torque rose to 18.4 N·m (13.6 ft·lbf) at 4600 rpm. The maximum speed remained at 85 km/h (53 mph), yet there was a marked increase in flexibility, chiefly noticeable on gradients. In October 1956, the Isetta Moto Coupe DeLuxe (sliding-window Isetta) was introduced. The bubble windows were replaced by longer, sliding side windows. BMW Isetta 300. This example has the early bubble window body. BMW Isetta 300 – Sliding Window 4-wheel LHD version. 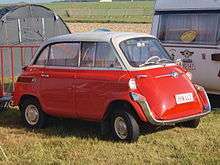 The BMW 600 was intended as an enlarged Isetta with more power and a more conventional four-wheel configuration. The front end of the 600 was virtually unchanged from the Isetta, but the 600's wheelbase was stretched to accommodate four seats. A conventional rear axle was added. BMW introduced the semi-trailing arm independent suspension on the 600. This suspension would be used on almost every new model for the next four decades. Because of the increased size and weight, the 600 had a more powerful engine than the Isetta. The 600 had the 582 cc twin engine from the R67 motorcycle. Top speed was 103 km/h (64 mph). In two years, only 34,000 600s were produced, partly due to price competition with the entry-level VW Beetle. In the late 1950s, consumers wanted cars that looked like cars, and they had lost interest in economy models. Sales of the 600 were, however, aided by the energy crisis of 1956–1957. With space for two and their luggage, the Isetta was perfect for the UK's urban and rural roads. The first motorway, the M1, did not open until 1959, and more conventional cars such as early models of the Morris Minor could barely top 97 km/h (60 mph). At one point, the British National Health Service started providing these vehicles for wheelchair users so they could drive while in their wheelchairs. Although noble in intent and many of these cars were made available free, the project was deemed unsuccessful and was terminated. In 1957, Isetta of Great Britain began producing Isetta 300 models at their factory in the former Brighton railway works under licence from BMW. The factory had no access by road, therefore components were delivered by rail and finished cars being shipped out the same way. The British cars had right-hand drive with the door hinged from the right hand side of the car and the steering column moved across to the right as well. Right-hand drive meant that both the driver and the engine were on the same side, so a 27 kg (60 lb) counterweight was added to the left side to compensate. Dunlop tyres were used, and Lucas electrics replaced the German Hella and Bosch components, with a different headlamp housing being used. Girling brake components replaced the ATE brake parts. The Isetta was not popular in the UK until a three-wheeled version was introduced. Although three-wheelers were more prone to rolling-over, there was a financial advantage; they could evade automobile legislation and taxation by being classed as three-wheeled motorcycles, and could be driven with a motorcycle licence. Isetta of Great Britain continued to produce four-wheeled Isettas, but only for export to Canada, New Zealand, and Australia. In 1962, Isetta of Great Britain also stopped production of the little cars but continued to produce Isetta engines until 1964. The now defunct British firm Tri-Tech, under the model name Zetta, sold a kit car or even an assembled complete BMW Isetta lookalike replica from modern parts, including Honda CN 250 cc single-cylinder water-cooled engines with automatic transmission (standard) or Kawasaki 500 GPS two-cylinder water-cooled motorcycle engines with optional manual transmission. Some parts, new or used, were from "donor" vehicles. Front suspension and steering were from the Bedford Rascal (later sold under the Vauxhall marque) or the original and almost identical Suzuki Supercarry light duty van or pick-up. Drum brakes and wheels were from Morris and the subsequent British Leyland Motor Corporation Mini. Prices ranged from c. £2650 for the kit up to c. £9450 for a complete version. It could be legally registered for use under British laws. Tri-Tech also supplied some body parts which can be used for running non-exact restorations of BMW Isettas. In 2016 Swiss entrepreneur Wim Ouboter showed a proof-of-concept electric car called Microlino at the Geneva Motor Show clearly based on the original Isetta design. In season 1 (episode 2) of Storage Wars, Barry Weiss surprisingly picked up a BMW Isetta wrapped up in a storage unit. In the TV series Family Matters, the character of Steve Urkel drove a BMW Isetta. In the original movie Bedazzled, the character Margaret gets into an Isetta with another man while Stanley (Dudley Moore) sees her off and proceeds to attempt suicide. In season 1, episode 8 of the TV series American Pickers, Mike Wolfe and Frank Fritz found two Isettas in a large junkyard. In the science fiction TV series Charlie Jade, episode 17 "Spin", there is a right hand drive sliding window Isetta driving through the scene in the Blade Runner-esque "alphaverse" at minute 29. The Depeche Mode video "Never Let Me Down Again" features an Isetta being driven whilst the follow on video "Behind the Wheel" begins with the car being towed away by a tractor. In the Stromae video "Papaoutai", an Isetta is shown in the main character's driveway, and later in the video is pushed into the driveway. In Genesis of Aquarion, Tsugumi Rosenmeier is shown driving an Isetta. In the music video for "Weird Al" Yankovic's "Whatever You Like," an Isetta is seen driving by immediately following the lyric "yeah, you like my Hyundai". In the TV series Heartbeat, the character of Gina Ward, portrayed by Tricia Penrose, drives a RHD sliding window red BMW Isetta 300. Two vehicles have been used bearing the original registration plates XAM 115 (1960) and KWC 796 (1962). In Series 11, Episode 6, 'Old Masters', a blue RHD sliding window BMW Isetta 300, appears 'broken down' at the side of the road, causing a problem for a man with his pregnant wife. The vehicle bears the registration plate 733 CLY; LY was a London NW area code. In the Hardly Working skit titled "Moth Attack" on CollegeHumor, the BMW Isetta is referenced when three characters are arguing about what size a moth would have to be in order to be considered a moth monster. An Isetta features prominently in a scene from the film, The Touchables. In the 50s sci-fi movie The Hideous Sun Demon, an Isetta can be seen in a parking lot while the creature is beginning to scramble up a hillside. Mike Brewer and Edd China restored an Isetta in a 9th series episode of Discovery Channel's Wheeler Dealers. In the British film comedy, "The Naked Truth (1957 film)" (US title: "Your Past Is Showing") Nigel Dennis (Dennis Price) is a blackmailer who travels in his Isetta to see his victims. In the video game "Wreckless: The Yakuza Missions" an Isetta is a drivable vehicle. In the video game "Forza 6" the Isetta 300 is offered in a DLC package. In the TV series Archer, season 4 episode 11, Sterling Archer is seen in an Isetta driving away from saving the Pope from an assassination. In the end credits for the movies Cars, the car portraying Mike Wazowski is an Isetta. ↑ In this context, 3-Litre refers not to engine size but to the fact that its low-friction 1-cylinder engine and low weight gave it a fuel efficiency of 3.3 litres per 100 kilometres (86 mpg-imp; 71 mpg-US)(manufacturer information). ↑ "The Year's cars". Automobile Year (1953–54 ed.). 1953. p. 37. ↑ "A brief history of Indústrias Romi S.A.". Indústrias Romi S.A. 2010. Retrieved 26 December 2011. ↑ "BMW Historie – BMW Isetta 250/300 Standard" (PDF) (in German). BMW.com. Retrieved 26 December 2011. ↑ Watson, David. "Isetta of Great Britain, Ltd. Brighton Works". Isetta Owners Club of Great Britain. Retrieved 26 December 2011. 1 2 3 4 Mort, Norman (2008). "1: ISO". Micro Trucks: Tiny Utility Vehicles from Around the World (illustrated ed.). Veloce Publishing. p. 9. ISBN 978-1-84584-175-1. By the early 1950s ISO had established itself as a builder of motor scooters, motorcycles, and similarly-powered and based IsoCarro vehicles, as well as refrigerators. It seems that the refrigerator reference is always included in a history of ISO because of its Isetta bubble car and its characteristic single front door. ↑ Mort 2008, p. 10. 1 2 3 Mort 2008, p. 16. 1 2 3 Mort 2008, p. 13. ↑ Mort 2008, p. 17. ↑ Mort 2008, pp. 11, 16. ↑ Mort 2008, pp. 10, 13. ↑ Mace, Robert (May 23, 2010). "Isetta VELAM". Archived from the original on 2007-11-07. Retrieved 2011-11-27. ↑ Shapiro, Helen (Winter 1991). "Determinants of Firm Entry into the Brazilian Automobile Manufacturing Industry, 1956–1968". The Business History Review. 65 (4, The Automobile Industry): 879. doi:10.2307/3117267. ↑ "1957 BMW ISETTA (300)". Lane Motor Museum. Retrieved 2010-06-12. ↑ Robson, Graham (March 2007). Elliott, James, ed. "Anorak's Corner". Classic & Sports Car. Haymarket Publishing. 25 (12): 226. ISSN 0263-3183. ↑ "Moth Attack". Hardly Working. CollegeHumor. Retrieved 22 May 2012. Wikimedia Commons has media related to Isetta.